The attacks in Paris earlier this month have united French citizens across the political spectrum. The Paris murders have been called France's 9/11 because they have stunned, shocked and angered the nation in ways comparable to the American reaction to the murder of over 3,000 of our fellow citizens. I remember well that in the few months following 9/11, the American intellectual world, especially that of liberals and left-leaning people, was in a state of welcome confusion. The familiar denunciations of American "imperialism" and the habits of sympathy for "national liberation movements" that had emerged in the protest against the war in Vietnam in the 1960s did not fit the realities of September 11, 2001. For on that day, Mohammed Atta and his associates attacked our country in the name of profoundly reactionary ideas, ideas more closely linked to Nazism than to Communism or the traditions of the left. Al Qaeda had abandoned the euphemisms of leftist anti-Zionism and spoke openly about hatred of "crusaders," that is, Americans and Jews. There were a few leftists in Europe and the United States who thought the American imperialists got what they deserved, but in those first months after the attack, there was an unaccustomed surge of patriotism among liberals, a sense of national unity and rage against the Islamists who appeared to many as the harbingers of a new totalitarianism. In the first months after 9/11, there was an unaccustomed surge of patriotism among American liberals, a sense of national unity and rage against the Islamists. The events of 9/11 caused a scrambling of political categories and led to the writing of important books. Paul Berman's Terror and Liberalism in 2003 examined the lineages between Sayyid Qutb's writings of the 1950s and the Jew-hatred of Europe's twentieth century. Berman demonstrated that Qutb, the Muslim Brotherhood's leading ideological figure after World War II, had placed totalitarianism and terror into an Islamic context. In 2002 in Germany, Matthias Kuentzel's Jihad und Judenhass (translated into English in 2007 as Jihad and Jew-Hatred: Islamism, Nazism and the Roots of 9/11) traced the Islamist tradition from Hassan Al-Banna and Haj Amin al-Husseini to Qutb, the Muslim Brothers, Al Qaeda and the Hamburg Cell that organized the 9/11 attack. I wrote essays discussing the similarities and differences between Nazism and the Islamists. In Germany, Bassam Tibi courageously distinguished Islamism and Islam, efforts that led to a book by that name in 2011. In Berlin, Richard Herzinger, writing for Die Welt, wrote of the threat Islamism posed to free societies and the need to fight against it. In spring 2006, Britain, Norman Geras and others wrote The Euston Manifesto, an eloquent effort to mobilize the traditions of British liberalism and the democratic left against the totalitarianism of radical Islam. In fall, 2006 some of us followed with an online statement about American Liberalism and Euston Manifesto. The shock of the attack had shattered old habits, fostered new thinking and led to books and essays that remain worth reading today. Sadly, the new thinking did not last long. Sadly, the new thinking did not last long, or rather, it lasted but was supplanted by experts who told stories about a "moderate" Muslim Brotherhood and about the need to avoid inflaming Muslims with public discussion of Islamism. Many decades of investment in the cultural capital of the conventional habits of left and right were proving too powerful to overcome. Even the administration of George Bush refrained from naming the enemy. It spoke oddly of a "war on terror" rather than one against radical Islam. With the US decision to go to war in Iraq, all of the old and familiar categories of thinking returned with a vengeance and especially so in Europe. Those of us who wrote about Islamist terror were accused of a newly invented sin, "Islamophobia." In place of a necessary discussion of the nature of radical Islam in its various permutations and of how to win the war against it, the controversy over the Iraq war reinforced the return to the conventional categories of left and right. In retrospect, the emergence of Barack Obama on the national stage was not an expression of new thinking. On the contrary, Obama stood for an academic orthodoxy that had become firmly established in American universities in the previous several decades. It was an orthodoxy that put him at odds with Benjamin Netanyahu, but also with the free spirits in Europe and the United States who had tried to break the left-right mold in the aftermath of 9/11 and foster a sharp confrontation with the anti-Semitic, illiberal and anti-Western elements of Islamist ideology. In the resurgent orthodoxy that took shape in the opposition to the war in Iraq, there was little room for attributing causal importance to Islamist ideology as a source of terror, hatred of the West and of the Jews. Rather, Al Banna, Husseini, Qutb and the successors in Al Qaeda and in the government of Iran were viewed as regrettable and mistaken reactions to the arrogance and blunders of the West. Hence, to call the source of terrorism by its name would only inflame passions and offend Muslims, whom Obama thought he could somehow turn into allies. The result was an absurd insistence that terrorists who have murdered tens of thousands in the name of their interpretation of Islam "have nothing to do with the religion of Islam," as if multiple interpretations of all religions have not had an impact on political history for centuries. The same standards of critique and selective reading that have been applied to Christianity and Judaism should be applied to Islam, no more and no less. Today, it is a common knowledge among historians of the Nazi regime that Hitler drew on a distorted and selective reading of the Christian tradition to justify his hatreds. Just as historians would not say that Christianity led to the Holocaust, so too we would not say that it had nothing to do with it at all. A very different understanding of Christianity inspired Winston Churchill and Franklin Roosevelt to fight against the Nazis. Yet however distorted the Nazis' selective reading of Christianity was, accusations against the Jews were a part of its religious teachings for centuries. The Koran did not lead to 9/11, Al Qaeda, Hamas or the Paris murders, but neither does a selective reading of some of its passages by young, impressionable minds have "nothing to do" with them either. The same standards of critique and selective reading that have been applied to Christianity and Judaism should be applied to Islam, no more and no less. Until this past week, when French Prime Minister Manuel Valls spoke so frankly in Paris, it has been primarily Israeli leaders who have been willing to publicly state the obvious about the impact of Islamism on the terrorism of recent decades. Now that Valls has stated clearly that France is, in fact, at war with radical Islam - and with the terrorism and anti-Semitism it inspires - the contrast with the euphemisms and avoidance coming from the United States since 9/11 is apparent. Three million people have just bought the first post-massacre edition of Charlie Hebdo. The French National Assembly sang the Marseillaise for the first time since 1918. Valls has said that if 100,000 Jews leave France, the Republic would be judged to be a failure. The candid talk in France is coming from left-of-center politicians. 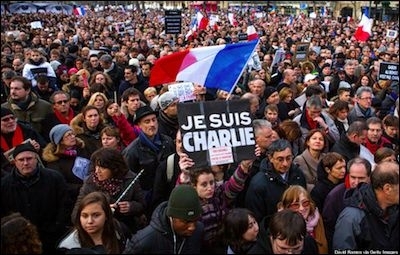 These days in France remind me of the autumn of 2001, when minds opened in the midst of mourning and anger. Yet within a year or two, a conventional wisdom and a refusal to speak frankly came to dominate American public discourse, continuing to this day. With the American experience after 9/11 in mind, one wonders how long Valls' willingness to speak frankly about radical Islam will persist, or whether the conventional wisdom many decades in the making will lead again to new forms of euphemism and avoidance. Jeffrey Herf is Distinguished University Professor in the Department of History at the University of Maryland in College Park and a fellow at the Middle East Forum. His recent works include: Nazi Propaganda for the Arab World (2009), and The Jewish Enemy: Nazi Propaganda during World War II and the Holocaust (2006).